For this Humidor cake, I made a 12x18 sheet cake and divided it into three layers.I made the sides and top from fondant colored like wood using food color mixed with vodka and painted to give a wood-like finish. I also added a little gold dust to give it that polished look. The hinges and nail heads were made from gun paste painted gold. 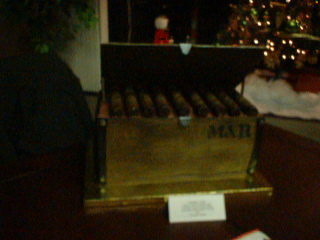 The cigars are made of chocolate that I order online with my husband's name on the label. I used two short dowel rods to hold the lid open.